Zia Pottery - English Pronunciation: "Zee-ah." To anyone traveling along the road eighteen miles northwest of Bernalillo, New Mexico, Zia Pueblo is almost invisible. It is situated on a rocky knoll, where it blends into the landscape like a natural feature of the terrain. For six-hundred plus years it has weathered the worst that man and nature could inflict upon it --- and it has survived. Although the Pueblo itself is inconspicuous, its Sun symbol is familiar to all New Mexicans, for it is the official New Mexico State insignia appearing on the state flag and adopted by the New Mexico Legislature in its salute, “I salute the flag of New Mexico, the Zia symbol of perfect friendship among united cultures. 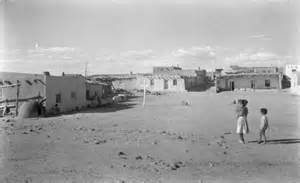 Zia Pueblo suffered disasterous losses in the Pueblo Revolt. Six-hundred people were killed and additional conflicts lasting for years reduced the population still further. 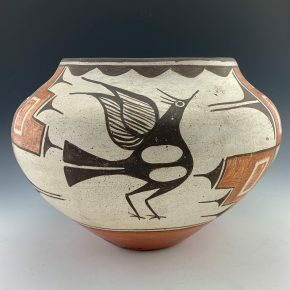 Prominent among Zia crafts is pottery, unpolished redware with white slip, with decorations in brown or black are produced often with a bird motif. The Zia tradition is faithfully adhered to; innovation is avoided. Some Zia painters have achieved recognition for their watercolors. The traditional language of the Zia Pueblo is Keresan. Elizabeth Medina is known for a traditional style of Zia pottery. Each piece is coil built, painted with native clays and native fired. This jar is painted around the neck with four different styles of birds. Separating each of them is a flower design. Below these birds is a cloud and rain motif. Around the shoulder of the jar, there are four additional birds, and each is different in style. Note that the red and tan areas are stone polished while the black and cream are matte. The lid has a bear design with a bird on top, making a total of nine birds on this jar! The jar is signed on the side “Elizabeth Medina, Zia”. Seferina Bell has long been considered one of the great Zia potters of the 20th century. This is a classic jar with three large birds. The birds are painted large and note the lines on the wings. Separating the birds are large cloud patterns which are polished red. They extend from the neck to the base. The bowl was slipped with the white clay and painted with the black and red clay. There is a beautiful patina to the surface of this large jar. It is signed on the side with a bell, which was her hallmark. Overall it is in good condition with no chips, cracks, restoration or repair but there is a slight lean to the form. It is certainly a classic of her work in design and form. Elizabeth Medina is known for a traditional style of Zia pottery. Each piece is coil built, painted with native clays and native fired. 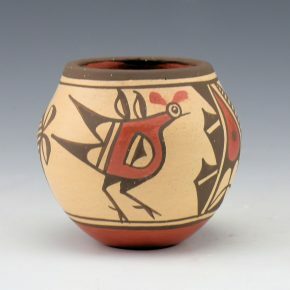 This jar is painted with a large bird with a rainbow band over the top of the section. The birds on each side are different in style. Overhead is a polished red rainbow band which has additional cloud and rain designs. On the sides are flowers and small hummingbirds! They are very charming. The jar incorporates various clay slips for the colors and some are polished and some are matte. The contrast of the matte and polished areas creates a striking appearance. The top of the lid is polished red while the turtle is added and slipped tan. There is a polished and painted bird and flowers on the top. The jar is signed on the side “Elizabeth Medina, Zia. Around the neck of the jar are rain and cloud patterns. Separating the birds are intricately painted flowers with polished petals. The jar is striking with the variations of matte and polished surfaces. The top of the lid is polished red while the turtle is added and slipped tan. There is a polished and painted bird and flowers on the top. The jar is signed on the side “Elizabeth Medina, Zia. This is a spectacular and massive storage jar bySofia Medina. The jar is made in the traditional style of Zia pottery. Each piece was coil built, painted with native clays and native fired. This is jar is exception form, color and painting. The jar is painted with four sections of birds. Each opposing bird is different. Over each bird is a polished rainbow band. Under two of the rainbows there are rain clouds. Under the other two are bird wings. Note the overall complexity of design from the base to the rim! The jar is simply beautifully polished and painted. Note as well the coloration of the jar, which a more brownish coloration for which Sofia was famous. Did you know that Zia potters use basalt as their temper for the clay, which gives these pieces their stability but also weight. The jar is in very good condition with no chips, cracks, restoration or repair. There is one small area of missing slip on the rim. It is signed on the side, “Sofia Medina”. 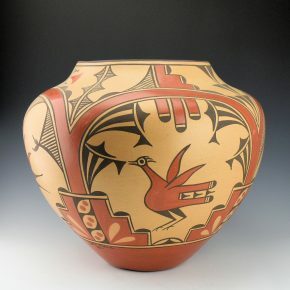 Not just a classic piece of their pottery, but outstanding in size, design and color as well! Sofia Medina and her daughter Lois Medina were known for a traditional style of Zia pottery. Each piece was coil built, painted with native clays and native fired. This is jar is striking in design and a very classic Zia shape with the high shoulder and slight neck. The jar has two large sections with birds and very complex double rainbow band. Separating each of the rainbow bands are small cloud designs. The bird is surrounded by complex rain and flower designs. The opposite sides have large birds with a single rainbow band and flower patterns. Note how the rainbow bands are stone polished areas! There are equally complex variations of fine-line and hatchtwork patterns. Did you know that Zia potters use volcanic basalt as their temper for the clay, which gives these pieces their stability but also weight. The jar is in very good condition with no chips, cracks, restoration or repair. It is signed on the side, “Sofia & Lois Medina”. Candelaria Gachupin was a granddaughter of noted potter Rosalea Toribio and the daughter of Maria Bridgett. 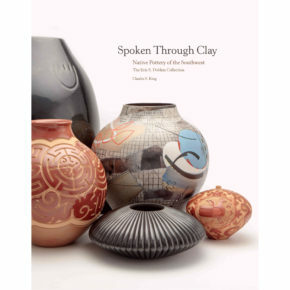 She taught both her daughter Dora Tse-Pe and son-in-law Ralph Aragon to make pottery. This jar was originally purchased in 1976. 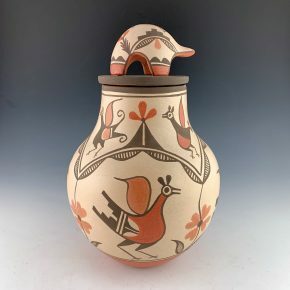 Candelaria was known for her stylized birds, which have long legs and are a visual “signature” to her pottery. This jar has three sections of birds with plants, separated by a polished red lightning band. Around the neck is a could pattern. 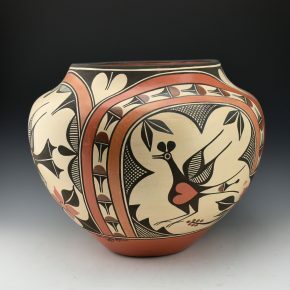 We do not often see a lot of her pottery but there is certainly a striking appearance to her designs. 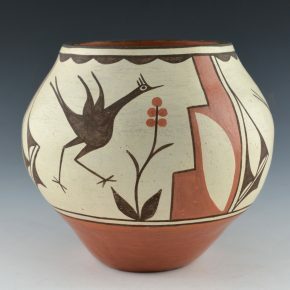 This jar is signed on the side, “Candelaria Gachupin, Zia Pueblo”. It is in very good condition with no chips, cracks, restoration or repair. It is signed on the side, “Sofia & Lois Medina”. Elizabeth Medina is known for traditional style of Zia pottery. Each piece is coil built, painted with native clays and native fired. The designs on this jar harken back to early Zia pottery with the hatchwork, prayer feathers and circles. There are two larger birds on the sides of the jar. They are slipped with a tan clay. Separating them are two smaller birds, also in tan. Surrounding the smaller birds are cloud, rain and prayer feather designs. The deeper red areas are both matte and polished. The jar is complex with the variations of matte and polished surfaces. The top of the lid is polished red while the turtle is added and slipped tan. There is a polished and painted bird and flowers on the top. The jar is signed on the side “Elizabeth Medina, Zia”. Sofia Medina and her daughter Lois Medina were known for traditional style of Zia pottery. Each piece was coil built, painted with native clays and native fired. This is jar is exception in the form and the painting. The jar is painted on two sections with a rainbow design and below the rainbow is a deer. The rainbow and the deer are polished with two different colored clays. 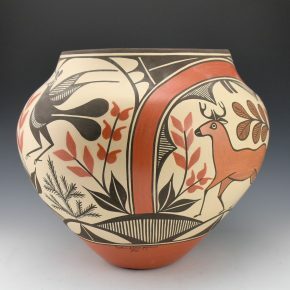 Note the leaves over the back of the deer and there are two different colors of clay in each leaf! The area around the deer has thinly painted lines. Separating the deer are two sections of large birds. Each bird is surrounded by plant designs along with cloud patterns. Did you know that Zia potters use basalt as their temper for the clay, which gives these pieces their stability but also weight. The jar is in very good condition with no chips, cracks, restoration or repair. It is signed on the side, “Sofia & Lois Medina”. 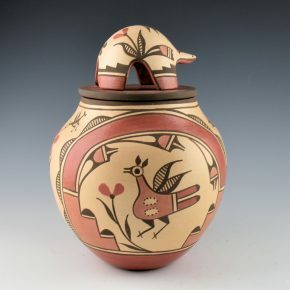 Not just a classic piece of their pottery, but outstanding in size, design and color as well! Marcellus Medina is known for his painting on traditional style of Zia pottery. Each piece is coil built, painted with native clays and native fired. 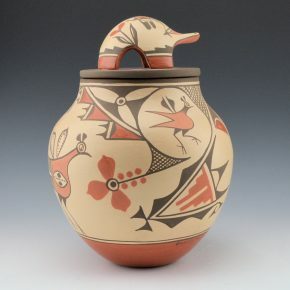 This small jar was made and painted by Marcellus Medina. There are two very classic Zia birds on either side. Each bird is painted with additional clay slips. Separating the two birds are cloud and rain designs. The bowl is traditionally fired and it is signed on the bottom, “M. Medina”.